Artist Alexander Ward talks us through his drawing process and explains how he got his first colouring book together, published now through Divine Arts. Read on to find out how you can win one of 3 signed copies he is giving away! 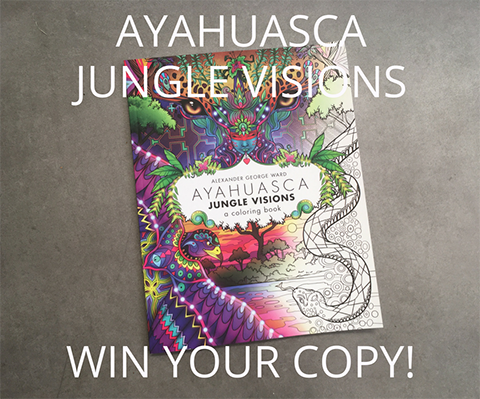 Artist Alexander Ward introduces us to his very unique adult colouring book, Ayahuasca Jungle Visions , inspired by his trips to the Amazon Jungle, and the Ayahuasca rituals he has taken part in. At the bottom find out how you can sign up to download your free page from the book and be in with a chance to win one of 3 signed copies he is kindly giving away. How did you get first get into colouring books? Millie Marotta creates her best-selling adult colouring books from a rural studio in Wales. In this exclusive interview we catch up with her following the recent release of her latest offering, Wild Savannah. Adult Colouring is becoming more and more popular as a relaxing and creative pastime, so why not join in the fun? These are the things I've learnt on my colouring journey so far. Claire Eadie discovered adult colouring as a way to deal with stress and and has since set up a brilliant online resource to help all novice and advanced colourists.